iRig KEYS is the universal portable keyboard MIDI controller for iPhone, iPad, iPod touch and Mac/PC that lets musicians create, compose and record on the go. Its plug-and-play design features 37 velocity-sensitive mini-keys, pitch-bend and modulation wheels, 5 backlit programming buttons and a volume/data knob. iRig KEYS is Core MIDI and USB class-compliant, so it works straight out of the box with no additional software necessary. It comes with a 30-pin dock-connection cable for iPhone, iPad and iPod touch, and a USB cable for hooking up to a Mac/PC. 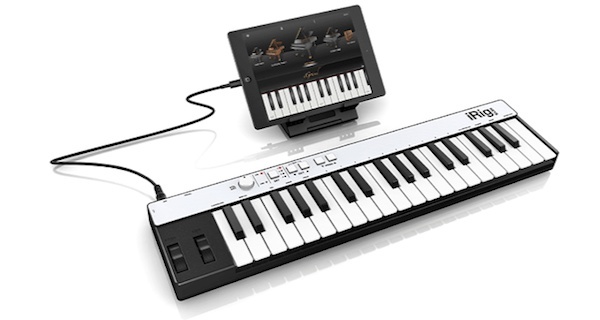 iRig KEYS is the perfect companion for creating music on the go. It comes with iGrand Piano FREE*, a concert quality piano app; SampleTank™ FREE*, a sound and groove module app; and SampleTank L** for Mac/PC. iRig KEYS works with all Core MIDI-compatible apps like GarageBand, and MIDI applications and DAWs on Mac/PC. When connected to an iPhone, iPad or iPod touch, iRig KEYS is powered by the device. For longer playing sessions, it can be powered through its USB port, like when it’s connected to a Mac/PC.